Andrew Roddick is an American former professional tennis player from Austin, Texas. 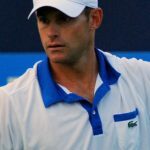 Roddick became a Grand Slam singles champion and world number one shortly after he won the title at the 2003 US Open, defeating French Open champion Juan Carlos Ferrero in the final and overtaking him as the top ranked player in the process. Despite several more years as one of the world’s best players, the 2003 US Open title would remain his only Grand Slam triumph. He is the most recent North American male player to win a Grand Slam singles event, reach the top ranking, and claim the year-end world number one ranking (2003). "When you come off something really disappointing, you want to come back and kind of regroup and get involved in something positive right away." "In the States, tennis is sixth or seventh on the totem pole as far as sports go."